Craft beer continued its maturation throughout 2014, with the number of North American breweries topping 3000 while taste trends continue to evolve. Amongst these trends are the continued normalcy of IPAs and DIPAs (and corresponding apathy towards this style that is now a base offering), increased sour emphases (especially in blends, saisons, Brettanomyces fermented brews, and other American Wild Ales), and an increasing shift away from bourbon in favour of wine barrel-aging for that musty, tannic, vinous funk of great complexity - when done right. Further trends include both the increased 'geekification' of the scene and a related, after-market marketization of traded products as hoarding, value-inflating, and muling are on the rise. Though I myself mule a few beers for close friends from time to time, I can't help but feel that practices like buying entire store stocks at 20% over cost before products hit the shelves for all to access and massive markups (such as those in advance of Bourbon County's Black Friday release south of the border) will only hurt the industry, not to mention the average craft beer consumer. However, it isn't all bleak and many bright spots remain. Perhaps my favourite news in beer this year is the newly increased availability and canning of Lawson's stellar Sip of Sunshine IPA, but without trekking to Vermont or Connecticut, it will remain somewhat of a commitment to acquire. I am thrilled to declare that, for me, this was the year of the Session Beer (in Quebec). Low alcohol session beers often lack the body to support their hops content and despite popular praise for some excellent American products, two Quebec products stood up to shine in the spotlight for me this year: Le Castor's Session Houblon and Pit Caribou's Session Brett IPA. 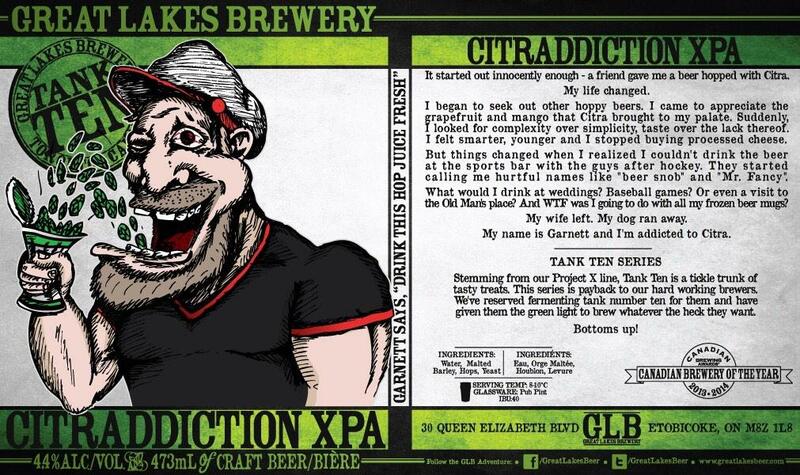 Ontario's Great Lakes Brewery also got in on the action with the once-again solid Citraddiction (whose label embodies the spirit of beer geekery)! Though Session Houblon may be a bit like Yakima lite, I love the 4.3% 22-ounce bombers that allow for a substantial beer with lower calories and alcoholic effect that combine with a fuller body than many session IPAs and a citrus-forward hops that stands up in flavour as in nose - a frequent limitation in many session IPAs. The year-round availability of this beer is an additional perk, as are its organic qualities if one finds that to be important. Session Brett, on the other hand, combines the mild dust of Brett fermentation with substantial hops creating a super drinkable blend of American hops and wild yeast, coupled again with the lower ABV that I so desire when done well. And this IS done well. Bravo, Pit Caribou, now please make it regular, or at least more regular! Now, the requisite best of lists and brewery of the year awards for Ontario and Quebec. I have, to my knowledge, included only beers released for the first time in 2014, though the breweries aren't new. Honourable Mentions: Special shout-outs to Dieu du Ciel! for Aphrodisiaque Rhum, to Pit Caribou/Le Castor for their 30 Cents Black IPA collaboration, and to Les Trois Mousquetaires for their Dixième (Black Kriek) and their Brett Saison that would have made the list if bottles had been created! Les Trois Mousquetaires built a strong case with a re-released Double IPA, another delightful batch of Porter Baltique Reserve, their tenth Anniversary Dixieme (dark kriek), and casks and kegs of the delightful Saison Brett. However, the limited availability (sellout within hours on the release day each year) of the DIPA and the limited availability of Saison Brett limit the success here. Their regular beers remain a touch sweet and, though I am thrilled to have this brewery and these delightful offerings, they won't be the Quebec Brewery of the Year for me, personally. Pit Caribou often fails to impress immensely with their regular lineup - outside of the fantastic IPA - but with their 30 Cents Le Castor collab and Session Brett, not to mention IIPA de la Sorcière, they have shown brewing prowess, awareness of trends, AND the crucial ability to nail them. Thus, they seem to be a rising force in the Quebec beer scene. Well done, Pit Caribou! Le Castor continued to brew the delightful Yakima, while adding Session Houblon to its regular offerings, and the aforementioned 30 Cents was a nice touch too. Their announcement of increased barrel and brett options for 2015 shows their conscientiousness and portends the potential for a rise as well, but this relative newbie from Rigaud assuredly holds much promise beyond their smatterings of hits thus far. Le Trou du Diable is always a perennial favourite in the province. Divine Comedie, Dulcis Succubus and Buteuse Brassin Speciale topped my personal favourites list, while the blended l'Ours and sour-brew le Coq are also nicely increasing in availability. Their case is boosted for me by the increased availability of their barrel-aged beers and the strengths of Dulcis and Buteuse BS, but though le Coq and l'Ours are fine, the retirement of Bretteuse and virtual non-availability of l'Imperatrice in favour of these others is the wrong choice in my opinion. Still, one can't really go wrong with beers of this quality and I continue to enjoy my growing TDD cellar! Brasserie Dunham Dunham not only increased barrel-aged availability, but released (not all for the first time) such treats as 3 Assemblages, Saison Reserve (my favourite of their beers), Jake Brett, Big Tom Pale Ale, Saison du Pinacle (dry-hopped), Saison du Pinacle Reserve, Stout Imperiale Russe (and BA variants), wine-BA Leo's Early Breakfast, Vladimir Sour Beaver Riot (and BA), and more, all the while hosting the best organized, well affordable, and pleasant bottle releases. Their ticket system and advance order process makes for a smooth release and, coupled with the quality of the beers, they have set a new standard for how such releases should be professionally handled. Keep up the amazing work, Dunham! Having missed many releases from Ontario this year, my list is a bit limited and isn't meant to be exhaustive, but illustrative of the keys gems released this past year that found their way down my throat. I will list but two contenders, Great Lakes Brewery, whose IPAs (and more) continue to wow, alongside Sawdust City whose growth and rise offer increased availability (and the now LCBO release of the Red Rocket Spiced Coffee Stout - though the draught version seemed a little tighter). Nonetheless, I continue to look for treats from these great brewers (Mike Lackey and Sam Corbeil respectively). But the winner has to be Bellwoods. In their third year of operation, Bellwoods stepped up its game. This trendy, Ossington strip, Toronto brewpub continues to impress with barrel aged treats (Grandma's Boy, Bring Out Your Dead, Motley Cru, Skeleton Key, and more) alongside regular offerings such as Roman Candle, Witchshark, Farmageddon, and the masterful baltic porter, Lost River (and many, many more). A must-drink, and by that I mean essentially anything brewed by this Toronto beacon should be imbibed whenever it can be (responsibly)! With that I bid adieu for the year. Happy New Year to all of you - may the evening itself provide for some excellent, responsible tastings, and may 2015 bring us all the best in beer and beyond!